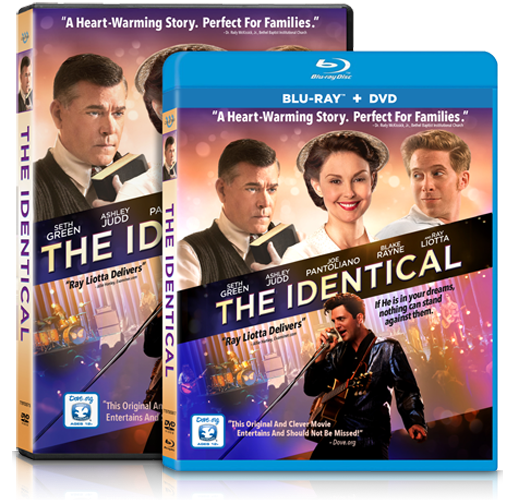 Over the weekend, my husband and I had the privilege of previewing a new Dove-approved inspirational movie, "The Identical," starring Ray Liotta, Ashley Judd, Seth Green, and Blake Rayne. The story is about a young man born in the mid 1930's who was separated at birth from his identical twin brother. He is raised by a preacher who wants him to follow in his footsteps, but his desires are for a career in music. Time passes by and the movie kept our interest as we followed the storyline and began rooting for the young man to finally become reconnected with his first family. The touching ending reveals the hidden truth of his past, a special reunion, and also a restored relationship with his adopted father. We would give it at least a 4 out of 5 stars. A good, clean movie. YOU have a chance to win a copy of this DVD for your own movie library! All you have to do is enter your name and e-mail address in the giveaway tool below and hit the "Submit" button. Super easy! This giveaway will close on Monday, January 19 at 8:00 p.m. CST. One winner will be randomly chosen by Giveaway Tools. I will contact you via e-mail if you have won and will allow 24 hours for a response before moving on to the next person. The DVD will be mailed directly to the winner by FLYBY PROMOTIONS. Elvis' mom wanted him to be a preacher also. The movie has somewhat of an "Elvis" tone to it. The main character looks and sounds a lot like him. Sounds interesting! I've never heard of it! Thanks!